Flowers: None Aspect: Partial or full shade. 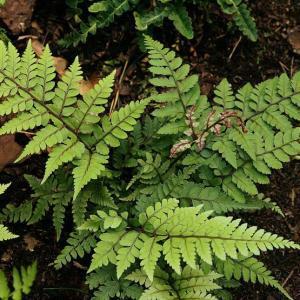 Athyrium otophorum 'Okanum' is a suberb fern with fronds of pale grey-green that contrast strikingly with the dark maroon leaf stalks. Early growth is tinged yellow. Plant in part to full shade, moist soil. Once established it will reach a height of 40cm x spread 30cm. Deciduous foliage. Plants supplied are in 9cm pots.